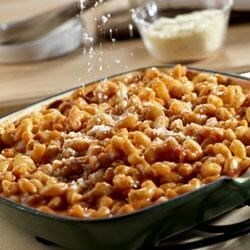 "Elbow macaroni is dressed with robust Prego® pasta sauce and a cheesy sauce for a double-good version of this classic favorite." Mix soup, pasta sauce, milk and pasta in saucepan. Heat through. I added 3/4 lb. of browned sausage, some extra Prego and an extra can of broccolli cheese soup. My kids loved it. It came out really bland .Only myson liked it.